I decided to make an ice cream cake for a 4th of July party that we were having. My whole family was going to be there except my 20 year old son. My son had just returned from overseas and would not get leave for a while to come see us. He is stationed in Virginia and I live in New Mexico. I thought since the rest of the family was going to be here we could Skype with him. I thought we could celebrate his safe return with a cake. I would of course make another cake when my son got leave to got visit us. As I was making my cake, I got an incredible surprise. My 20 year old son walked in the house. I did a second look as I was not expecting my son for at least another month. It was just like what you see on TV. The soldier surprising his mom after he had been overseas for 7 months. I was overjoyed that my son was able to be at our July 4th party. We were able to celebrate with him in person instead of online. My son returned to the states on July 1st and drove 3 days to surprise his family. It was awesome! Here is the easy cake I was making when my son walked in. 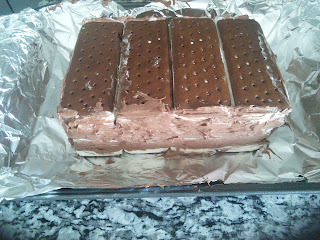 I was making an ice cream cake as it was too hot to turn on the oven. 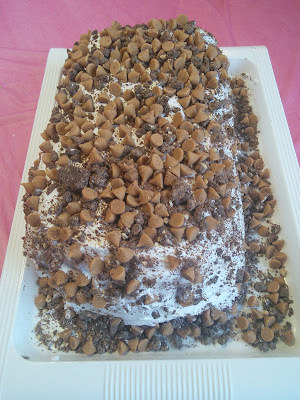 I know what you are thinking an ice cream cake is hard to make, but this one is easy to make as it uses ice cream sandwiches. The pictures don't really show how great the cake looks as it was a cloudy day and I was very distracted with the surprise visit from my son. Trust me this cake tastes delicious and is very rich. I was able to get 12 generous servings from this cake. This pictures below are in order showing the steps to making the cake. I did not get pictures of the frozen whipped topping step or the sprinkling of Heath milk chocolate toffee bits as like I said I was distracted with the joy of my son coming home. I will make this cake again to get better pictures. 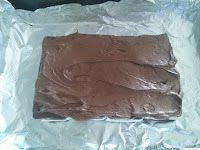 My son will be here until July 15th and that is the day of his birthday, another reason to make a cake. Line a cookie sheet with foil and make sure the cookie sheet fits in the freezer before you start. 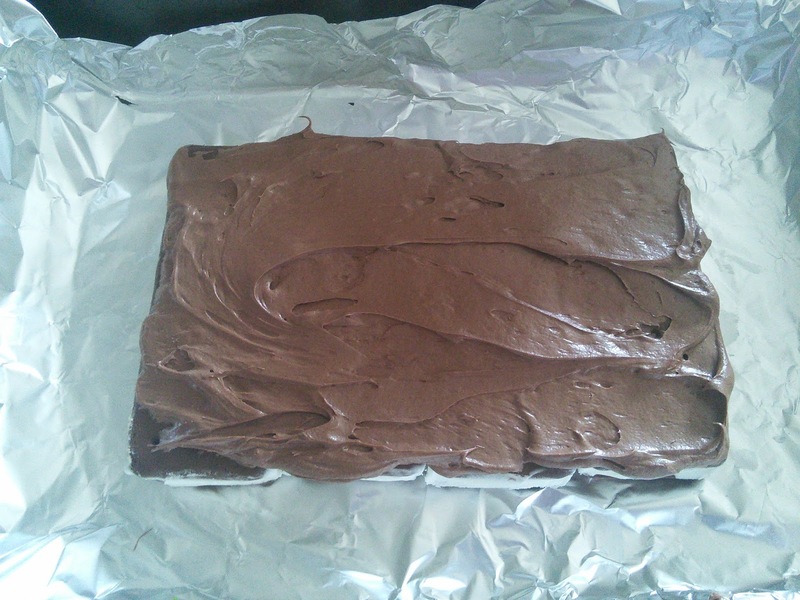 You will be placing the cake in the freezer between steps and when it is complete. 1. 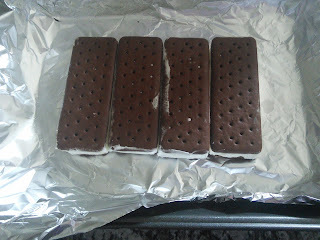 Place 4 ice cream sandwiches on the foil and then spread the frosting on top of the sandwiches. Place 4 more sandwiches on top of the frosting and then spread more frosting on those sandwiches. 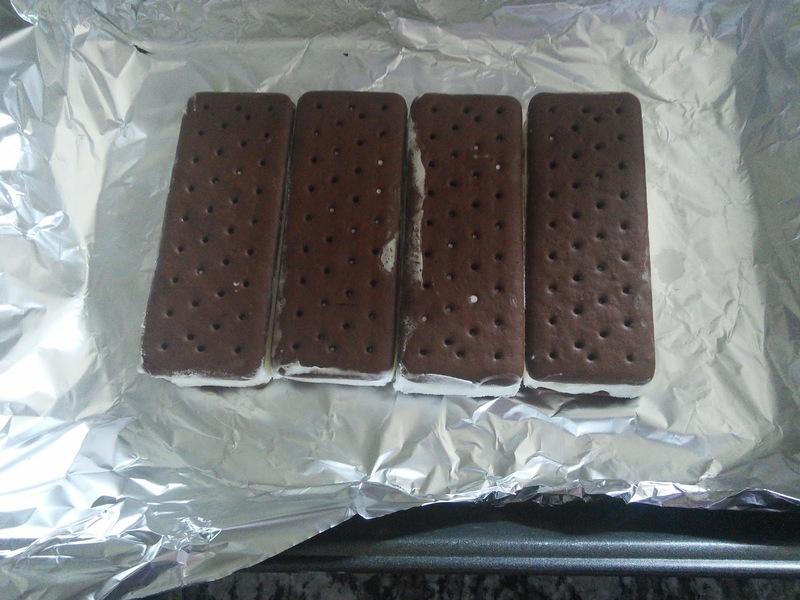 Place the remaining ice cream sandwiches on the frosting. 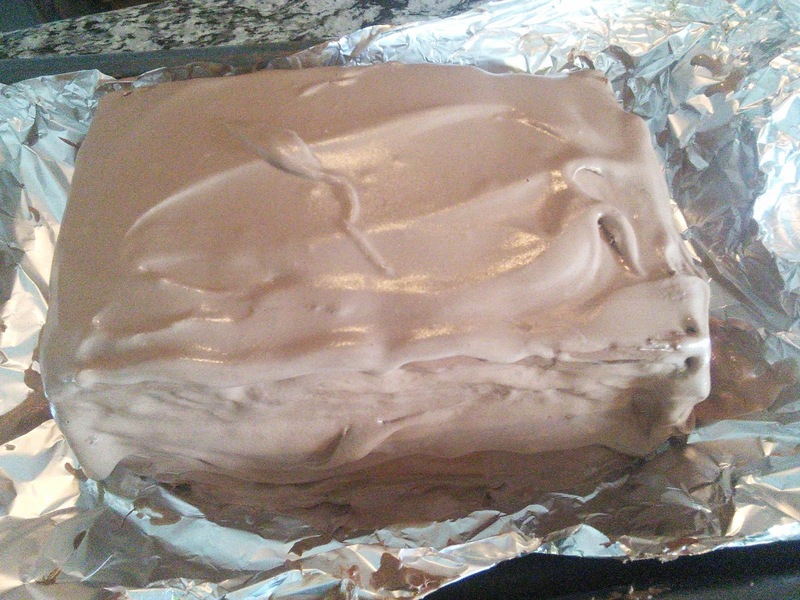 Use remaining frosting and spread around the outside of ice cream cake. Place the cake in the freezer for 30 minutes. 2. Take ice cream out of freezer and put in and bowl. 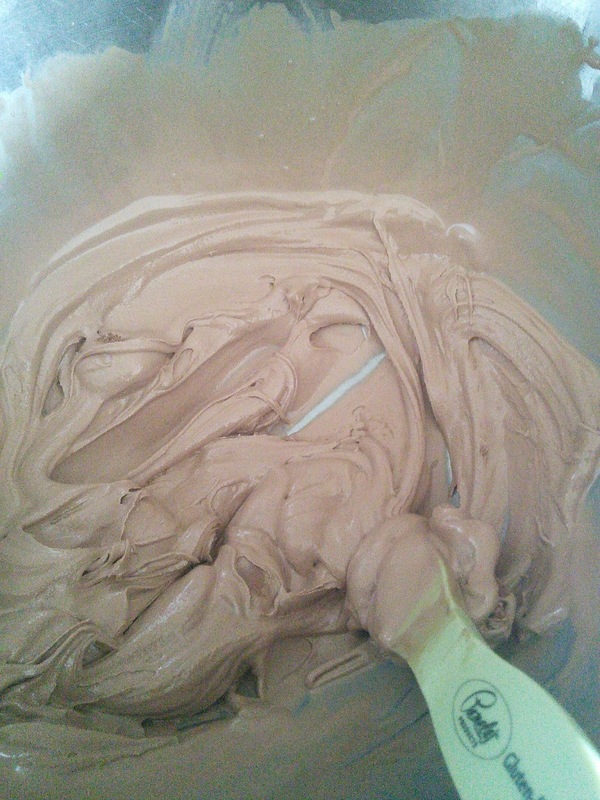 Using a spoon cream the ice cream until whipped topping consistency. Then frost the ice cream cake with the ice cream. Frost all over the sides and top of cake. Work quickly as the ice cream melts fast. Place the cake back in the freezer for 30 minutes. 3. Take the cake out of freezer and spread the thawed whipped topping all over the top and sides. 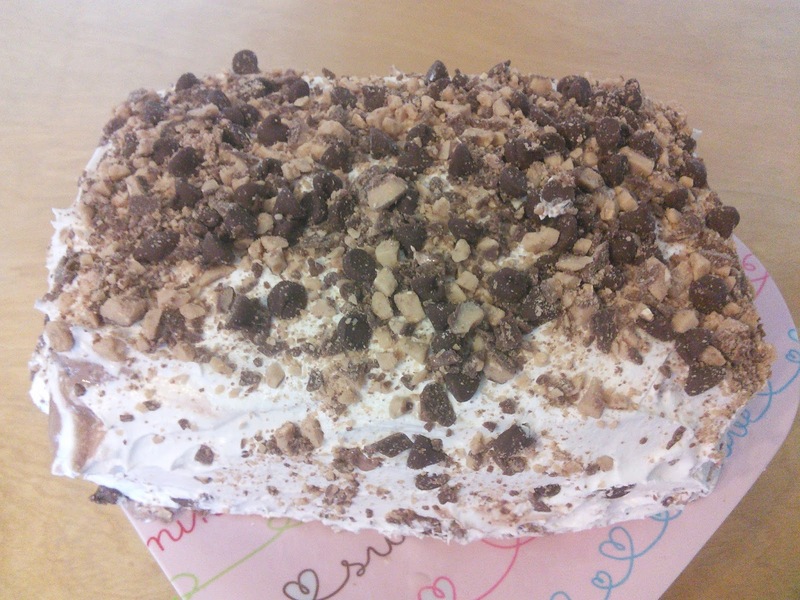 Sprinkle the topping of your choice, I used a mixture of Health bits and chocolate chips, all over the top of the cake. 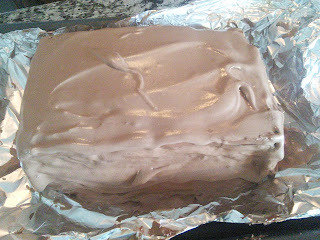 Wrap the cake up in foil and place in the freezer. Keep the cake in the freezer for 2 or more hours before serving. When you take the cake out of the freezer, sprinkle with more topping, if needed. To serve the cake, just slice it into slices. 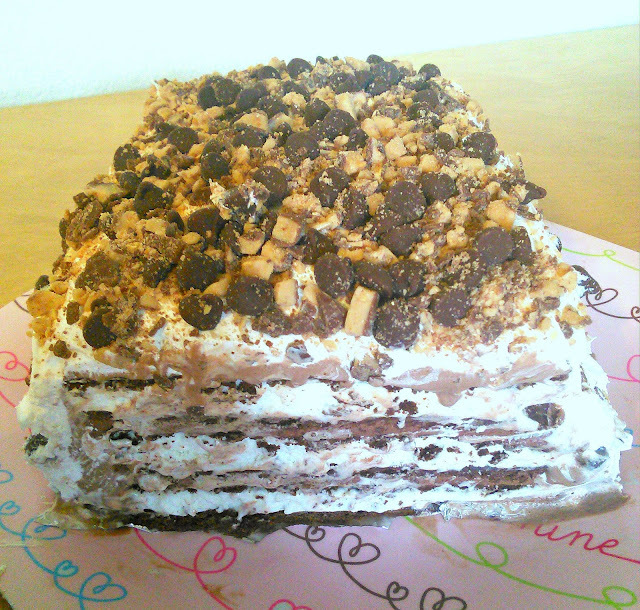 I made another ice cream cake for another party. This time I used butterscotch chips and chocolate pieces. The cake looks delish--SO glad you got to see your Son!!!! Great cake and congrats on seeing your son! Please tell him I said thank you for his service! Looks amazing!! Perfect for these warm months! :) Pinned it! Oh my! That looks so good!!! What a wonderful surprise! And that cake looks TOO yummy. I'm sure your son enjoyed every single bit! Yum!!!! I haven't made of these in years! Yes, they are delicious and so easy to make. I think I may one of these this weekend. Thanks for sharing! Very nice!! This looks delish! :) I want some!! What a happy surprise!! The cake looks wonerful too. That looks really yummy! Hope you and your son enjoyed it!